The biceps muscle is in the front of your upper arm. It helps you bend your elbow and rotate your arm. It also helps keep your shoulder stable. Tendons attach muscles to bones. Your biceps tendons attach the biceps muscle to bones in the shoulder and in the elbow. If you tear the biceps tendon at the shoulder, you may lose some strength in your arm and be unable to forcefully turn your arm from palm down to palm up. Many people can still function with a biceps tendon tear, and only need simple treatments to relieve symptoms. Some people require surgery to repair the torn tendon. There are two attachments of the biceps tendon at the shoulder joint. The head of your upper arm bone fits into a rounded socket in your shoulder blade. This socket is called the glenoid. A combination of muscles and tendons keeps your arm bone centered in your shoulder socket. These tissues are called the rotator cuff. They cover the head of your upper arm bone and attach it to your shoulder blade. The upper end of the biceps muscle has two tendons that attach it to bones in the shoulder. The long head attaches to the top of the shoulder socket (glenoid). The short head attaches to a bump on the shoulder blade called the coracoid process. Biceps tendon tears can be either partial or complete. A complete tear of the long head at its attachment point in the glenoid. Partial tears. Many tears do not completely sever the tendon. Complete tears. A complete tear will split the tendon into two pieces. The long head of the biceps tendon is more likely to be injured. This is because it is vulnerable as it travels through the shoulder joint to its attachment point in the socket. Fortunately, the biceps has two attachments at the shoulder. The short head of the biceps rarely tears. Because of this second attachment, many people can still use their biceps even after a complete tear of the long head. When you tear your biceps tendon, you can also damage other parts of your shoulder, such as the rotator cuff tendons. There are two main causes of biceps tendon tears: injury and overuse. 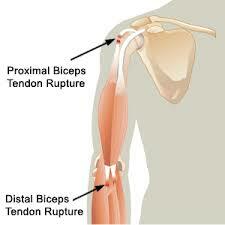 If you fall hard on an outstretched arm or lift something too heavy, you can tear your biceps tendon. Many tears are the result of a wearing down and fraying of the tendon that occurs slowly over time. This naturally occurs as we age. It can be worsened by overuse – repeating the same shoulder motions again and again. Overuse can cause a range of shoulder problems, including tendonitis, shoulder impingement, and rotator cuff injuries. Having any of these conditions puts more stress on the biceps tendon, making it more likely to weaken or tear.